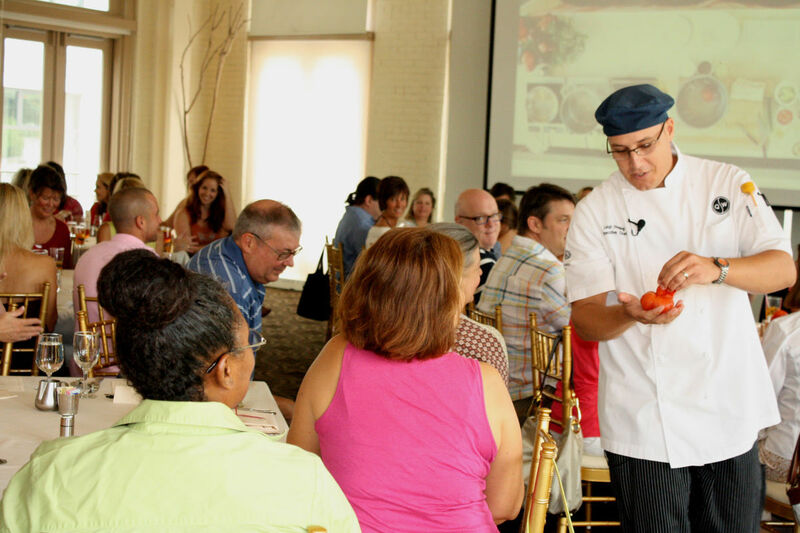 Print Works/Green Valley Grill’s Cooking Class series is and isn’t about the cooking. Sure, Executive Chef Leigh Hesling shows you step-by-step how you’re dish is prepared, aided by large video screens and mirrors. This sit-down food-and-wine pairing is all about experiencing the textures, aromas, taste, culinary ambiance and fellowship with your table mates. This three-course meal varies depending on date and season — and what’s in season. The wines paired with the courses are particularly well-thought out. Chef Hesling claims Australian roots, his Aussie accent unmistakable. He’s part Julia Child, part Tasmanian devil and equal parts Barnum & Bailey. He and his assistants fly around the room, dropping ingredients tableside or showing the dish in-process. Yep, you get ’em. Each step of the prep work, sauce, or entrée is outlined on a set of cards so you can follow along. Even if you never try to replicate the dish, you’ll learn cool tips and tricks of the trade. This kick-starter is a special concoction from the resident mixologist — and explains why I’m spending more and more time in the bitters section at my favorite food store. Well-chosen from the U.S., Spain, France, Portugal, Germany and Australia. Chef Hesling explains why they work alongside his dish. Most fun you can have with your clothes on. The 2018 series makes a special holiday gift. Tickets: $85 per class or three for $235. Order at www.printworksbistro.com/cooking-class/ or contact Lee Healy at 336-478-9126 or lhealy@qwrh.com. Reservations required. Ed Williams, director of public information at Alamance Community College, likes to pass along helpful tips from this class to culinary students at his college.